Last week, we used the Gate for drum replacement. This week, let’s use it to tighten up an electric bass part—and end up with a rhythm section that’s tighter than a comic book superhero’s costume. We’ll use a fairly basic example of sidechaining to create this tightness. While most people understand the principles behind sidechaining, I haven’t heard very many people actually use this particular application. But with electric bass, using a drum sidechain signal to gate the bass adds a percussive overlay to the bass’s melodic character that fits perfectly with drums. For the bass sound, in this example I’m using my bass expansion pack for Cakewalk’s Rapture Pro (I’ll be porting the samples over to Presence XT soon). 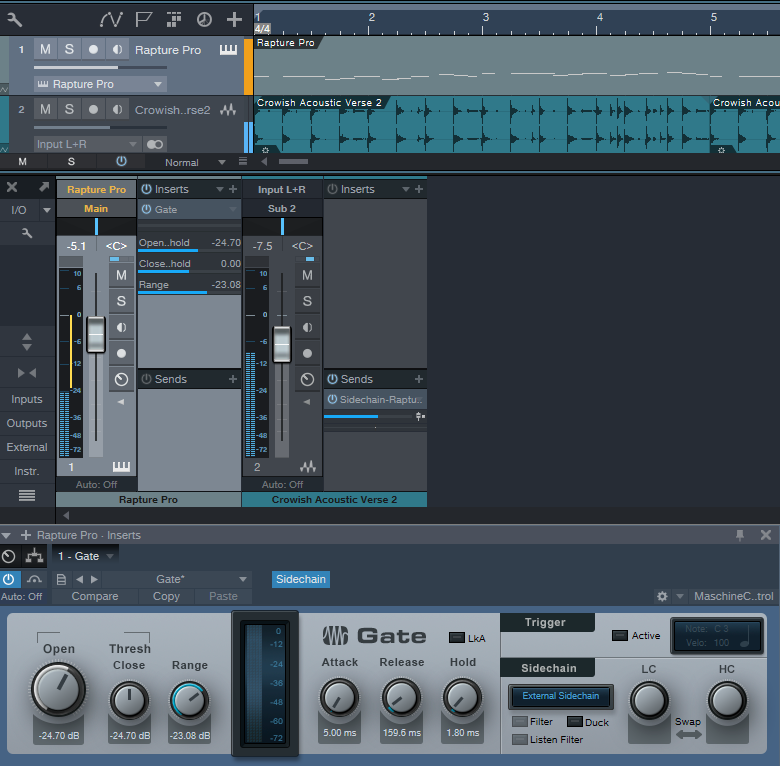 The drum loop track has a send that drives a Gate inserted in the bass track, with the Gate’s sidechain set to External so it’s triggered by the drum’s audio. Although different situations call for different Gate settings, I find the key to getting good results with electric bass is the Gate’s Release control. Because bass has a natural decay, a little release time prevents the bass from sounding too percussive—the attacks are all properly in place, but the bass note trails off gracefully, even though the drum transient may be long gone. However with more electro-oriented material, using a sharp decay with an electric bass provides an unusual type of effect—you have the organic, natural sound of the electric bass modulated by the clipped, percussive decays caused by gating with the drums. As always, experimentation can yield interesting—and sometimes delightfully unexpected—results. Try it!